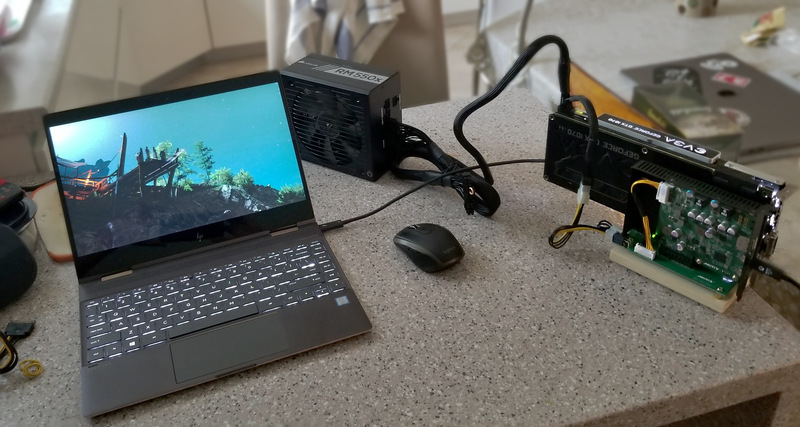 I originally just put this on my blog, but I wanted to post an abridged version here since egpu.io was useful and inspirational when I embarked upon this project. Hope this post will inspire someone too! I initially built it using the power supply I extracted from the Akitio Node Pro itself but that power supply unit overheated and died. Initially, it worked, as you can see from the pictures. However, after I carried it in the checked in luggage, its fan no longer turned on. The power supply overheated and stopped working. I didn't try to fix it, adn I can't really tell if it was damaged during travel or if the uni was just not up to challenge. I just bought a Corsair RM550x instead. 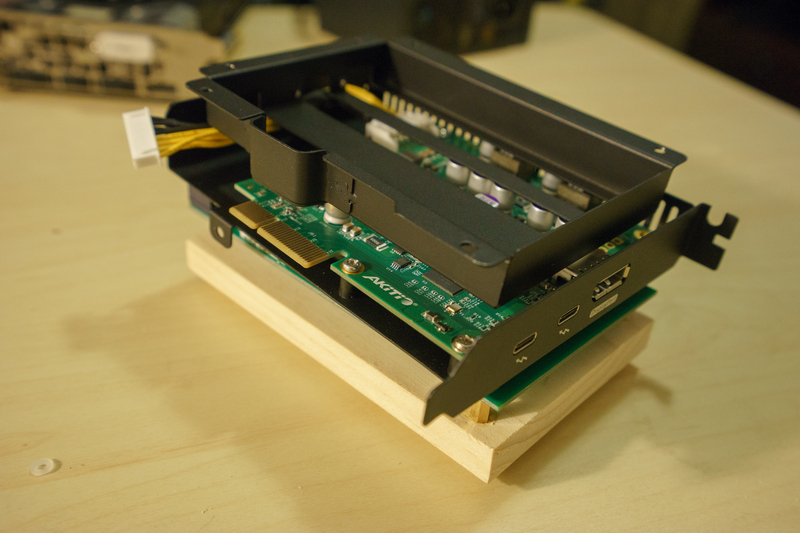 In addition to the GPU hardware, you need something to mount the GPU on since you no longer have the case. I used a piece of wood and standoffs to mount one of the boards. The longer version with a lot of details and pictures is on the blog. Here's a short version. Extract the Thunderbolt 3 board, the board with the PCI slots, and the power supply. 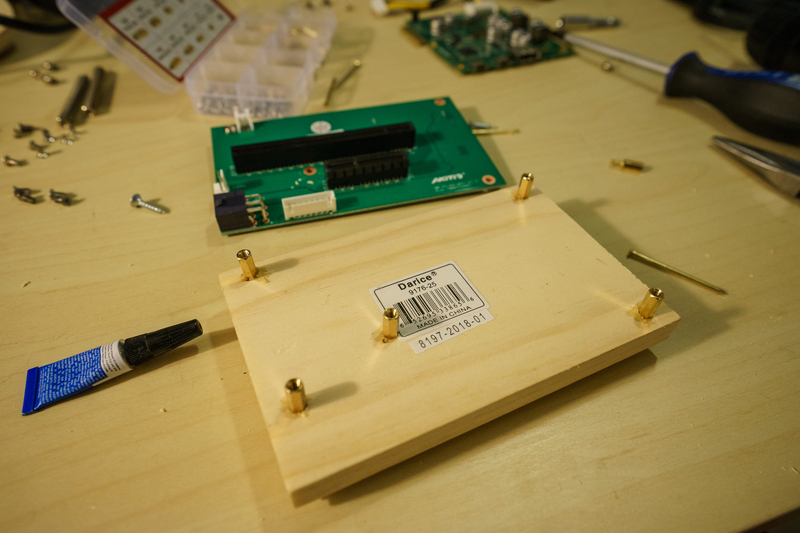 Use the PCI board to outline where to mount the standoffs on the piece of wood. Measure twice cut once, and practice mounting on some other board. Mount the boards back together. Plug the cable into one of the PCI slots and enjoy. With the ATX power supply you need an extra step: short-circuit the connector so that the on/off switch actually powers the device on, as shown here. All benchmarks are done on the internal laptop's display. I loved that 4k display so much that I didn't want to use external non-4k displays. The performance was good enough so I didn't try to improve it with external display. This worked great (except for the part where the Akitio's Power Supply stopped working). I mean, I didn't really tinker with any of the new components, but I'm happy to report everything's working as expected. Plug-and-play works, no reboot needed. Laptop charges while playing. Linux (Ubuntu 18) and Windows alike recognize the GPU. Games released in 2016 (tested with DOOM) and 2015 (Witcher 3) work. No BIOS tweaks needed. Nvidia drivers downloaded from the nVidia website work. Internal display works fine too. In fact, I'm a huge fan of the 4k display now; I've never experienced one, and I think it improves gaming experience. There was no need to install an external display to improve performance. Anyway, I hope this will be useful to some. Please feel free to check out the full posh, or ask questions here. Any feedback appreciated. P.S: So does anyone know why all TB3 enclosures for full-size GPUs include gigantic cases??? 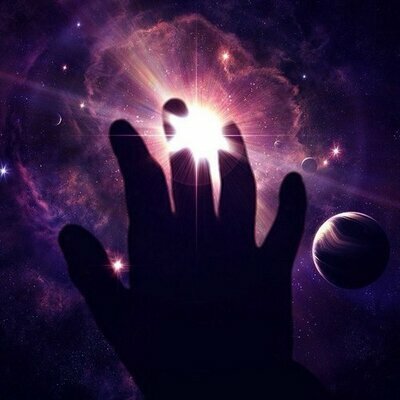 @shvedsky , I'm with you. There exists a hole in the TB3 market place for a lightweight, no-frills open pcie adapter like a EXP GDC seen for mPCIe/EC interfaces. The reduction in weight from a lack of enclosure should ideally translate in a lower cost. The present Intel certification landscape requires eGFX enclosures to be a enclosed solution. 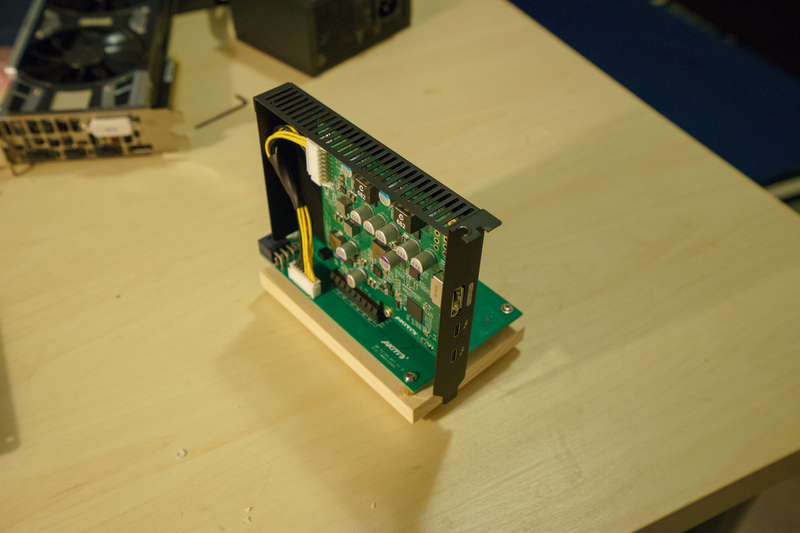 So it seems then the workaround solution is to remove the TB3-PCIe board as you have done. The present Intel certification landscape requires eGFX enclosures to be a enclosed solution. (I got a private message but I can't reply yet because of spam filter, so I'll post a reply here) I was asked if I'm happy with the setup after I used it some. I can say that yes I am. The new power supply works perfectly. Although I didn't have 10-hour gaming sessions so far (one is planned for this weekend :D), short ventures into the world of Witcher 3 are as good as it gets. 2) The 6 feet cable is very long (duh). Because of its length, it's easy to slightly touch it and disconnect it from the enclosure. It seems that the cable can move inside the port a bit and disconnect if you're not careful, which will cause the 3d game to crash. @shvedsky Hey thanks so much for the benchmark! 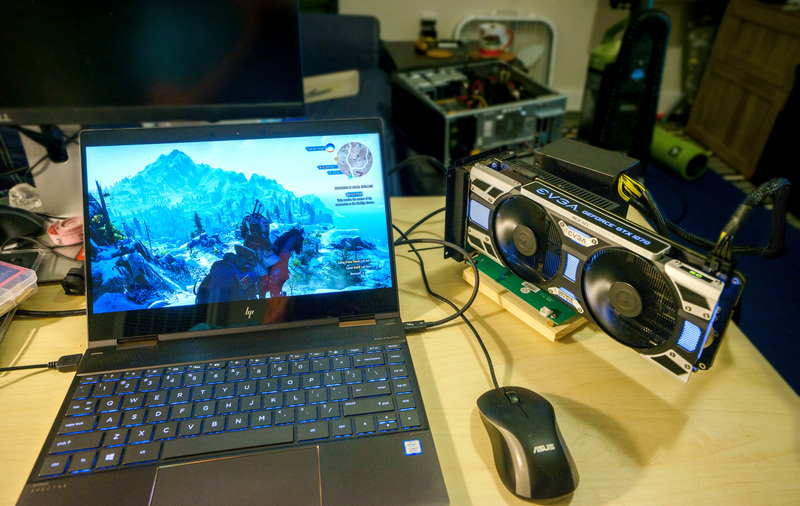 I've been looking at a 4k laptop set up with eGPU too lately. I have been getting very polarizing opinions on wether internal 4k (or 4k in general) works for eGPU. I am planning on getting the aorus gaming box with 1080 in it, and I have seen people saying it won't get above 20 fps even on web browser to 4k actually is better suited for eGPU. 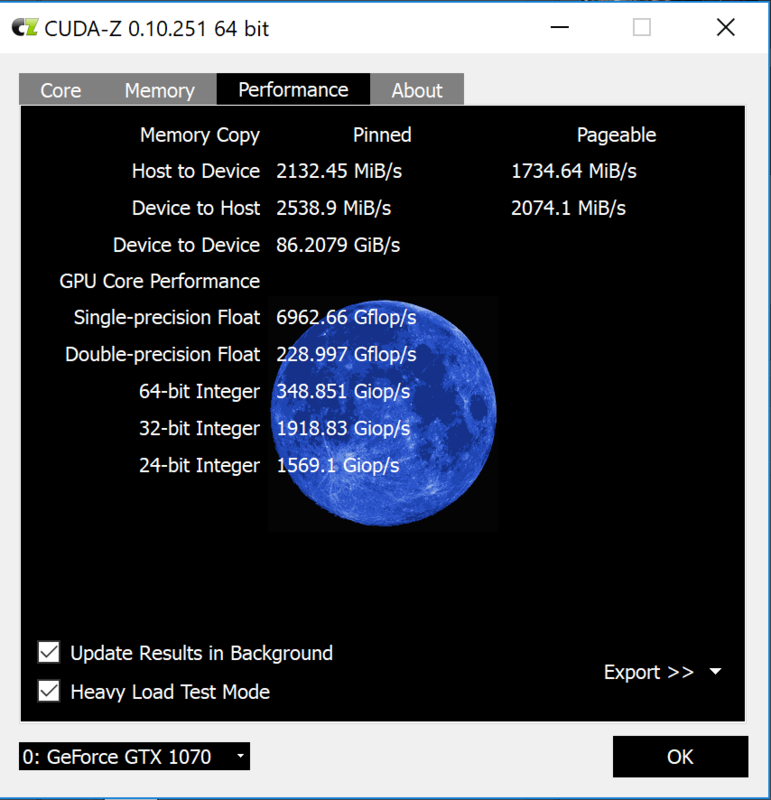 Just want to ask how's your experience gaming on an internal 4k display with eGPU? Is there a lot of stutter? Is the fps maintanied at a playable rate? @steven_zhao - 4K on an external monitor works and works well. 5K also works. I run both. 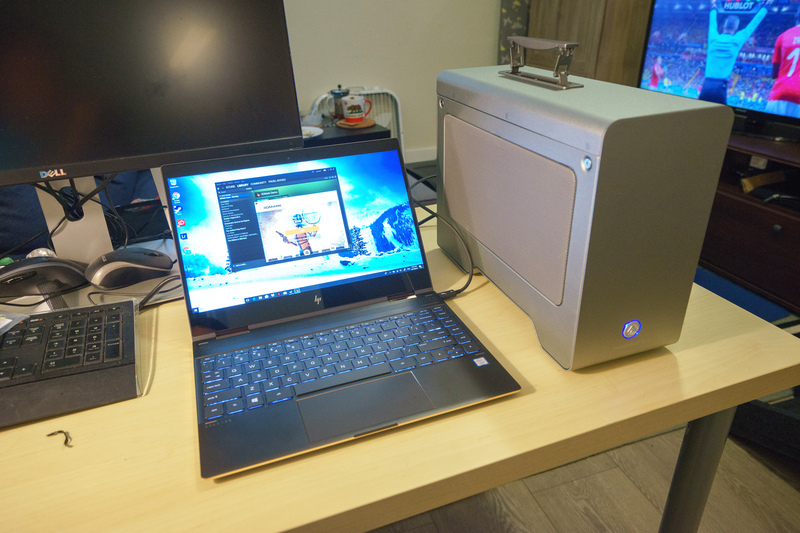 It is "better suited" because a higher res means a lower frame rate, which means that the performance is closer to the desktop, due to the fact that a lower frame rate lowers the bottlenecks from the two things that impact eGPU frame rate: TB3 latency/bandwidth constraints and the weaker mobile CPUs. I play World of Warships, and I have no issues running at 80fps at 4K. Don't try 4K gaming on an internal monitor - It is very much not recommended. Scaling down to 1080p would be okay-ish, but worse than an external screen. In general, 4K displays on laptops are not terribly useful, unless the system is a large 17" one, and even then. 13/14" 4K panels are more power hungry than 1080p ones, leading to worse battery life, and they are definitely too small for that many pixels to be of a benefit. 4K at 24/25/27" looks great, and even then a lot of people will need to scale things beyond the default 100% so they would not be too small. I am also an HP user. I will use your post as a template to build my release.